374 km, 14 days. Circular tour circling Berlin. The “66-lakes” walk is an important route in the state of Brandenburg. The trail leads through an area rich of forests and wetlands, including many lakes (66 Seen). But there are also villages on the route, agricultural land, and - especially in the western part - several castles and parks. The trail begins in Potsdam (Sanssouci, Cäcilienhof, Marble Palace), but of course, you can start anywhere, for this is a circular walk. The trail describes a wide arc around Berlin; however, you won't fancy that the capital of Germany is that close. If you are going to undertake this walk, then it makes sense to pay Berlin a visit. Everywhere along the route you will find bus and train links. Also, there is no shortage on overnight addresses. 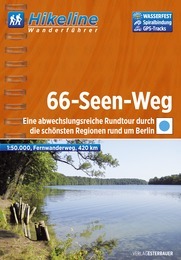 Excellent page by Fernwege.de on the 66 Lakes Trail, with sketch maps, route description, GPS donwload, documentation. Day to day description of the 66 Seen Regionalparkroute with map and GPS data. Short intro, plus Google map. Interactive map and click-on to detailed maps.